Balance sheets are a very important document to track the coming and goings of your cash flow over a specified period of time. Maybe you’re thinking about expanding, buying another location, or just want to make a few upgrades to keep up with your growing client base. Well, that’s going to take a large amount of money. The Financial Balance Sheet Template is a fast and free way to document all the information you need to project your future expenses and income and relate that information to receive a much needed loan. Make your goals and ambitions for the future of your business a reality with this simple template. Start by clicking on the link located at the bottom of this page. You will immediately begin downloading the free template to your computer. Let’s start off with the positive aspect of your business, the assets. This will include everything from your inventory to the accounts receivable that will grow over time. This section is located at the top of the page. To change any of the pre-written items, simply click inside the cell and start typing. This way, you can edit or change the document to include specific items for your unique business. Your liabilities and equity will also play a major role in your balance sheet template. The template provides you with a list of everything you need to include for these two sections. You need to enter the amount of liabilities (loans, bills, etc.). Your equity will be the amount of money you have invested in things for your business, such as property or your returned earnings over time, based on your invested capital. After you have gone through and entered all this information in the required sections for the “Beginning” column, you need to fill out the “Projected column. It’s important to keep realistic expectations for the future and base your figures off of the data you have already entered. 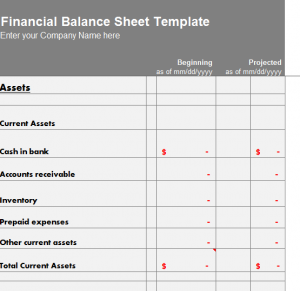 With this balance sheet, you should have everything you need to impress the banks and potential investors.